The one inch wide dollhouse kitchen mixing bowl shown here is an easy project to make from polymer clay. As shown, the bowl is based on the traditional "Cane" design earthenware bowls of UK firm Mason Cash which have been in use in kitchens for more than 100 years. These are the bowls seen in the vintage kitchen of Downton Abbey and other famous settings. I've shown the bowl in the traditional 'yellow' earthenware. You can make modern versions in your choice of colors, or use the process to make simple pudding bowls and other simpler kitchen bowl forms. See the rest of the steps to learn how you can make this miniature with basic craft materials and tools. The next step is to make the basic bowl former. 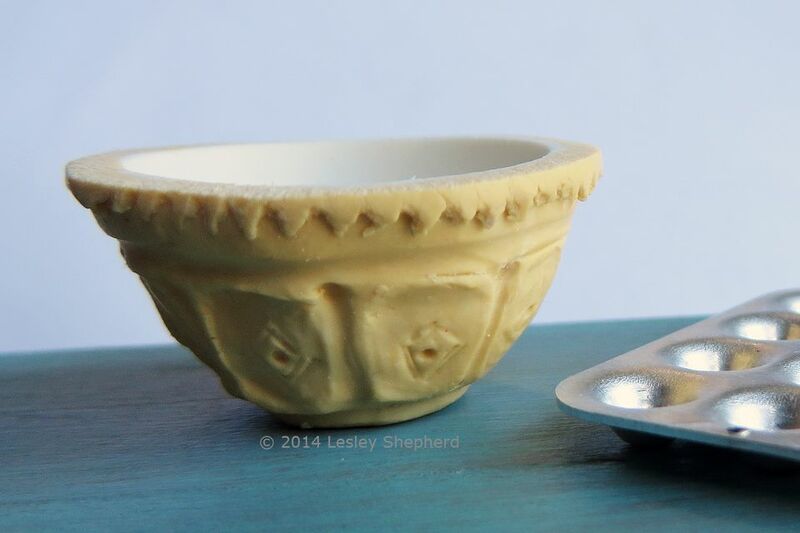 Miniature bowls with rims and side designs are easiest to shape over a firm bowl mold. I used two part silicon mold putty to make a mold which can be used in an oven with polymer clay. If you are new to working with polymer clay read the information on safe handling of polymer clay before proceeding. The silicon putty form will release the clay easily, but is firm enough to work over with modelling tools. You can also work over a suitable bead or other shape, provided you treat it with a release agent for your polymer clay (talcum powder, water....). To make my miniature kitchen bowl mold I plunged a wooden bead, with the hole filled with clay, into a soft ball of modelling clay (plasticine). After I carefully removed the bead, I checked that the shape was smooth with no cracks or holes, then placed a thin layer of two part silicone mold putty in to the mold and allowed it to harden. Using a thin layer to start with prevents the formation of air gaps like you see in the rejected mold to the right in the photo. Once the first putty layer has set, you can insert a second layer of putty inside the first. If the second layer forms air holes they won't affect the thin outer surface of your mold which is already firm. Turn the mold upside down after filling it with putty, so the putty sets squarely on a surface so that it will have a squared off base. The next step will show you how to use the basic bowl former to make a range of miniature bowls. To begin making miniature kitchen mixing bowls over your silicone bowl form you can start with colored or white clay. For the traditional bowl, I used a thin layer of thoroughly mixed 1:1 white and translucent polymer clays for the thin lining layer. The clays were rolled out and draped over the bowl mold then press firmly down so the lining layer is slightly deeper than I want the bowl to be. For the outer layer of the traditional bowl, I mixed 1:1 amounts of the lining clay mix, along with basic ochre colored clay. This will give me the light ochre color of the traditional 'yellow' earthenware mixing bowls. The ochre clay was rolled out very thin and cut into a rough circle then draped over the lining clay layer, gently pressing in the excess clay at the upper edge of the bowl as shown in the photo on this page. The next step will show how to begin adding a rim and shaped details to the bowl sides. The traditional Mason Cash "Cane" pattern mixing bowl has a series of imprinted ellipses with diamonds and dots. You can mimic this design in miniature by hand tooling it, or by using a simple stamp to set the basic pattern. To begin, trim your polymer clay to the height where you want your bowl to end, using a clay blade or a piece of fine wire. When the bowl is the roughly the correct height mark where the bottom of the rim will fall. For my bowl I used eight repetitions of a version of the traditional ellipse design. To work out the spacing and the size if you wish to make a stamp or divide your bowl into sections, use a piece of thread to measure the top (below the rim) and bottom (above the foot) diameter of your bowl form. Divide this measurement by the number of sections you want, in order to work out the top and bottom dimensions of each section. The ellipse shapes are narrower on the bottom than on the top of the bowl. In the traditional design the shapes are separated by a 'bone shaped' indent. I used a ball ended embossing tool to make this shape as a way to mark the side divisions around my bowl. The next step will show you an easy way to make a stamp to mark a pattern on the side of your bowl. You can easily make an simple stamp for the side sections of your bowl using the "miniature cookie cutter" technique of folding heavy foil strips (cut from a recycled foil plate or pan) or bending a shape from a plastic straw. If you have the correct size of plastic straw, simply shape a rounded oblong using tweezers. A slightly more involved method uses a strip of foil to make an oblong which is wider on the top than on the bottom. I set the shape into 'waste' polymer clay for a handle. I also set a small diamond made using the same technique into the center of my main cutter or stamp. When I had it the shape I wanted, I cleared the polymer clay from the edges of the bent foil to allow it to press into my bowl, and baked the foil and clay stamp at the correct temperature for the clay to set the clay. This will hold the foil shape while you work with the stamp. The next step will show how the sides can be marked without the aid of a stamp using simple modelling tools. Once you have the divisions marked off on the sides of your miniature mixing bowl you can use a stamp (made from foil or a straw, see previous step) or modelling tools to mark off the pattern on the sides of your bowl. If you use a stamp, line it up just below the rim of your bowl and 'roll' it gently down the sides as you mark the design from top to bottom. With the stamp design marked, you can use simple modelling tools to refine the shape if you wish. I used silicone tipped shaping tools to "draw" the general outlines of my shapes between the marked divisions. You can also use pins, wooden toothpicks or other simple tools. For this to work well, your clay needs to be very flexilble and elastic. This is one reason I use a fair amount of translucent clay in the color mixes I used for my bowls. The outline was pushed up from the inside of the design to give a raised line effect. The small diamonds were marked out using the same tools, then a dot was set into each diamond using the end of a fine ball ended embossing tool. You can use a paint brush, or the silicon tipped tools to smooth the surface of your clay between your raised design lines. A bit of baby oil on a brush may help to keep the surface smooth but don't overdo it! The next step will show how to finish the rim and foot of the traditional kitchen mixing bowl. The traditional mixing bowl in dollhouse scale is finished by smoothing out the lines below the rim of the bowl and trimming the upper edge of the rim with a piece of fine wire or a polymer clay blade. The foot of the bowl is formed by pressing a modelling tool at the base of the sides to form the outer rim of the bowl foot, then pressing the round end of a pencil eraser or some similar tool into the center of the bowl foot to form the rim. To add the half diamond edge to the top of the rim, I used a strip from the cutting edge of a box of foil as a shape, rolling a thin roll of ochre colored clay over the edge of the foil, then cutting the clay free from above to leave a neat toothed edge. You could also use pinking shears or decorative scissors. Once the decorative side of the edge is shaped, a clay blade is used to cut the plain upper edge of the rim section. The toothed edge was then laid over the top of the rim and gently pressed against the rim to hold it in place. The final steps are to trim the top of the bowl and set it on a baking tile or baking surface so the foot of the bowl sits square. The bowl former is then set into the oven with the bowl still set onto it, footed end facing up. Cure your clay at the temperature and time recommended for your brand. When the clay has cooled, carefully remove your bowl from the former. Use find sandpaper to sand the top rim true and smooth. If you wish, you can finish your bowl inside and out with a thin layer of semi gloss acrylic glaze or varnish, which will give the bowl a glazed earthenware look. You can use your silicon form over and over to make a wide range of bowls. You can make simple colored bowls without shaped sides, and add small spouts to mimic modern plastic mixing bowls if you wish.